Google set to relaunch Google TV as Android TV | What Hi-Fi? Leaked images suggest that Google is reinventing its TV platform. Android TV will be a platform that provides on demand content, apps and games. 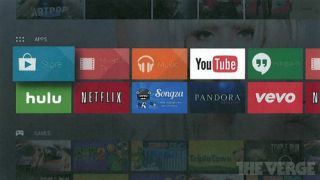 Google is planning a new look Google TV platform called Android TV, providing access to Google Play apps and content in a fresh assault on the living-room. The Verge reports Android TV will be a set-top box, with leaked images showing what appear to be scrollable 'cards' that depict 'Movies & TV ', 'Music' and 'Store'. The interface also has apps for YouTube and Google's Hangouts messaging service. What is also apparent though, is that Google has called upon third party content providers such as Netflix, Hulu and Pandora to join the Android TV platform. Google has said it wants to provide personal recommendations for users as soon as they turn the TV on. Users will also be able to continue watching a film or TV show from where they left it on their smartphone or tablet. We've seen previous incarnations of Google TV, such as the Sony NSZ-GS7, but these were hampered by a lack of apps and content. Now it seems Google is trying another approach. Google commented on the new service, saying: "Android TV is an entertainment interface, not a computing platform." "It's all about finding and enjoying content with the least amount of friction. It will be cinematic, fun, fluid and fast. Android TV is Android optimised for the living room consumption experience on a TV screen." The box will come bundled with a controller comprising four directional buttons, as well as Enter, Home and Back buttons for simple navigation. It will go up against Google's own Google Chromecast HDMI dongle. The difference between the two devices is that Android TV will have application access built-in, with an interface, whereas Google Chromecast allows users to stream from a mobile device. News of Android TV has come less than a week after the announcement of the Amazon Fire TV set-top box. Fire TV offers much of the same experience: access to Prime Instant Video, Netflix, Hulu and more. Pricing and availability has yet to be announced for Android TV, but Google's annual I/O event takes place in June. We expect to hear more details then, so will report as and when we hear anything.